Pamela Prichett was born in New York City into a colorful and creative home of art and design, and developed a love of making things from an early start. After graduating from the Rhode Island School of Design, where she studied glass and film, she lived in California where she worked as an editorial illustrator for several years before returning east to pursue a career in art direction and graphic design. She currently lives in NYC, where she runs her studio 40N47 Design, Inc. with her husband Diego and has raised her 2 children. She shares her love of art and design through her volunteer work for NYC public schools teaching art and providing design services. 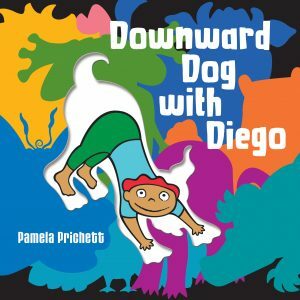 Her first children's book, Downward Dog with Diego, was inspired by her experience creating identity design and artwork for a children's yoga program. Her most recent project, Zoomorphik, features animal inspired textiles and yoga play pillows based on the colorful characters from her book. You can see more at zoomorphik.com and 40N47design.com.